One of the most important functions of HR is to help businesses acquire and retain top talent. Perhaps that is why more and more companies are turning to mentoring programs as a way to set themselves apart from the competition. In fact, today more than 70% of Fortune 500 companies offer employee-mentoring programs. We all know that mentoring can play an important role in advancing employee development efforts. Mentoring is proven to drive valuable learning and growth opportunities for all of us whether we’re mentors or mentees. It provides a way for people to connect with others to explore their next career move and how best to get there. It creates an avenue for honing and developing talents and skills, while making employees more confident in their abilities and more connected to the company. Mentoring allows mentors the opportunity to provide valuable guidance and direction to others and to share knowledge in ways that create more engaged, confident employees. The benefits of mentoring for companies are well known. There’s plenty of research to show that mentoring bolsters recruiting, increases employee engagement, helps ensure leadership continuity, increases diversity, and improves loyalty and retention. Yet high impact mentoring programs don’t just happen. There are a number of challenges that companies face when crafting successful programs that easily scale. Often the processes that enable mentoring are manual, complex, and difficult to manage. The matching of mentors and mentees is time intensive and ineffective. Furthermore, for most organizations mentoring programs are incredibly difficult to track and measure. 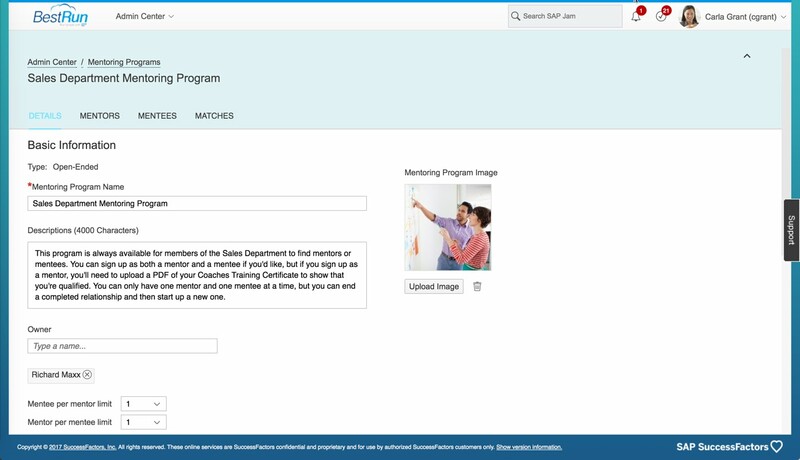 This is where our new intelligent mentoring capabilities, launched late last year and delivered as part of SAP SuccessFactors Succession and Development come into play, helping companies simplify how they create, manage, monitor and report on sustainable mentoring programs to further enhance career development and growth. Our capabilities make it easy to set up and launch mentoring programs at scale, automatically and intelligently match mentors and mentees, connect and guide participants to engage, and easily track and measure program effectiveness and success. Feedback from early adopters of the tool has been very positive. Over the past several months, one thing customers have been asking for is support for additional types of programs. After all, most customers that invest in mentoring want to support a range of learning and development objectives whether its leadership development, career development, role development, executive coaching, diversity and inclusion, employee and manager onboarding, etc. To be able to offer various programs, organizations need the ability to support different structures (e.g., supervised vs. unsupervised, open vs. invitation-only, time-bound vs. open-ended). 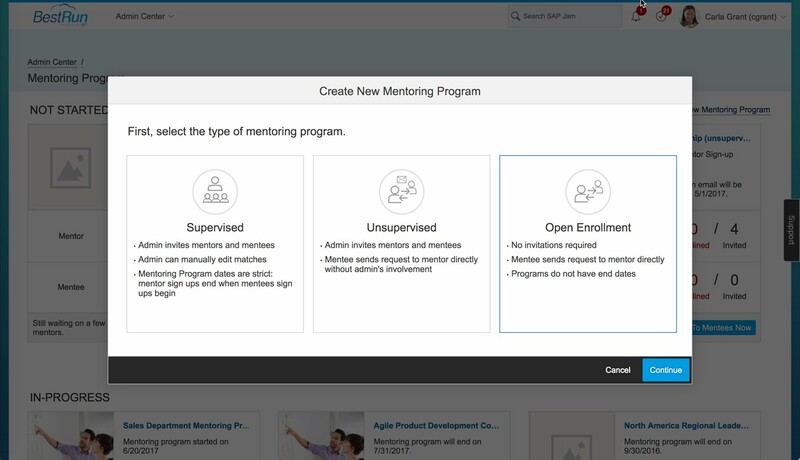 That is why we’re particularly excited to announce that as part of the Q3 SAP SuccessFactors release we’ve expanded our mentoring capabilities to support open-ended mentoring programs. Now in addition to invitation-based mentoring programs, customers can support mentoring programs that are available to employees without invitation and where there is no end date. Employees can simply opt in to participate in a mentoring program as either a mentor, mentee, or both. 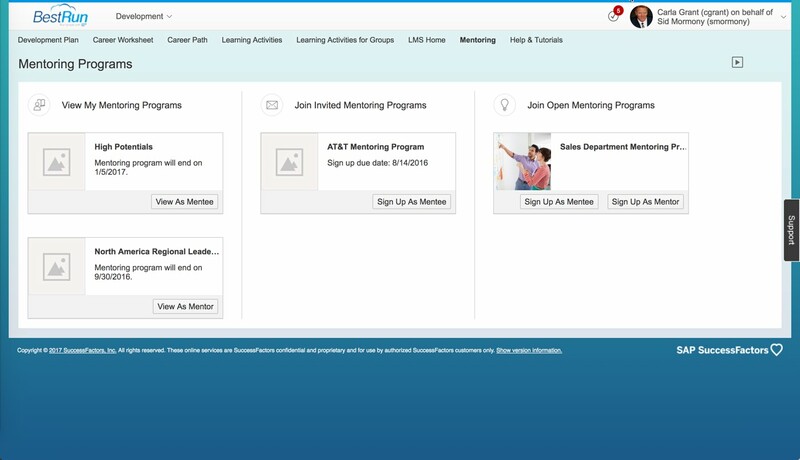 Program admins can set up open-ended mentoring programs in a matter of minutes. In many organizations, employee development initiatives consist of informal mentoring that takes place within and across teams as well as more expansive mentoring programs that might be open to all employees and not have specified start and end dates. When setting up an open-ended mentoring program, program admins can make the program visible to all employees, or a target group based on employee attributes (such as job level, department, location, etc. ), and allow participants to self-enroll as either mentors, mentees, or both. Our simple wizard-based solution makes it easy to create and manage any number of mentoring programs. Mentees can simply search for mentors and then initiate a relationship. The qualification of mentors for participation can also be configured if desired, either via manager approval or by requiring mentors to attach documentation to their program registration. Programs can be set up so that managers need to approve mentors who would like to participate. Successful mentoring programs offer both structure and flexibility. Structure provides participants a mentoring workflow to follow and is critical to help participants achieve learning that meets their specific needs. Similarly, flexibility is essential to support varying individual mentoring needs across specific learning goals, preferences, and learning style. Because our capabilities provide both structure and flexibility, customers can more easily and effectively create, launch, manage, and scale programs across their organization. End users will have a new programs home page which will display open-ended programs. By being able to offer additional types of mentoring programs, customers can expand and scale their mentoring initiatives and drive true impact for the organization. Are you interested in launching mentoring within your organization or expanding your current efforts and want more insight into best practices? Our HCM research team led by Steven Hunt has conducted a research study on this topic and will be publishing a Mentoring best practices paper in the next month so be sure and stay tuned. In the meantime, we want to hear from you. How you are approaching mentoring today? What’s working? What’s not? What roadblocks do you face when it comes to effective mentoring? What features would make mentoring more effective within your organization? If you have two minutes, please complete this short survey. If you’d like, we are happy to provide you a copy of the findings. 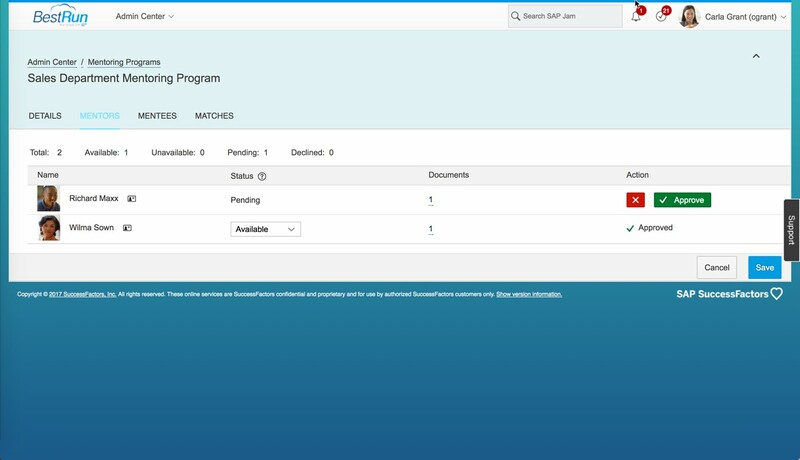 Learn about other new features and enhancements for SAP SuccessFactors Succession and Development (which includes Mentoring) as well as the full SAP SuccessFactors HCM Suite by reading our Q3 2017 Release Highlights document, or by viewing our Q3 2017 release video on YouTube. You can also learn more from customers and experts at SuccessConnect in Las Vegas taking place August 29-31. Our next release is planned for Q4 2017. We’ll send you a summary of release highlights shortly beforehand. However, you can review a detailed release summary, which is published in our customer community, four weeks prior to the release. I was actually managing and running a Junior supervisors mentoring program in my previous organization. I was part of a team of program managers. I agree with you, as you rightly said, it is often a challenge to match mentors with their mentees. The matching rules hardly matches the needs and interests of the mentees. Instead we just update the mentors skills, expertise and personal interests on the portal. Employees who were interested can approach them ( Mentors) if they were available. We even arranged a couple of ice-breaking sessions as part of the initial meeting as well as preliminary networking and workshops. A channel where people can get to know each other. In addition, the specific challenge was that the mentees preferred a structured approach towards the entire 2 year program which aligns with their development initiatives. So we had structured a 70: 20: 10 program similar to many HR IDP (Individual development plans). It is something similar to the mentoring workflow you mentioned above. 70% of the time would be spent on a challenging cross functional project with the help of the Mentor. 20 % of the time on self-learning and 10% of the time is spent on attending conferences and workshops on the advice of the Mentor. We continued with this model for about a year. We left the monitoring and recording the progress responsibility with the mentees and updating the program managers. It was partly successful. But then maintaining and sustaining the momentum throughout the program was very challenging. Some mentees dropped out halfway.